Puda Coal, through its affiliates and controlled entities, supplies premium grade coking coal to the steel making industry for use in making coke. The Company currently possesses 2.7 million metric tons of annual coking coal cleaning capacity, and management believes it is the largest coking coal cleaning company in terms of capacity in Shanxi Province, China. Shanxi Province provides 20-25% of China's coal output and supplies nearly 50% of China's coke. 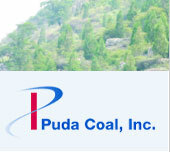 About this company Puda Coal, Inc.